Transcription work is near and dear to me. It is the very first work from home job I ever held. After I quit my job to become a freelance writer, I had to have some kind of money coming in until my writing career took off. And that’s when I found my first transcription job by accident while looking for writing gigs on Craigslist. Although I did not have transcription experience, I applied and was (thankfully) hired after I passed a transcription test. That job introduced me to the work-from-home world, and I’ve been working remotely ever since. Working as a transcriptionist helped me through a difficult financial time. And so when someone reaches out to me about working from home or making extra money online, I’m always quick to suggest transcription work. Fortunately, there are companies who offer transcription jobs online for beginners. In fact, I’ve compiled a list of 19+ transcription jobs online — no experience required! 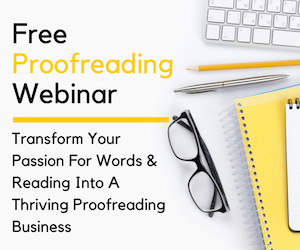 Ready to jump right in and build your own transcription career? That’s the spirit! I highly recommend taking one (or both) free mini courses over at TranscribeAnywhere. One is a general transcription course and the other is a legal transcription course. Taking them will give you a much better understanding of what it takes to become a successful transcriptionist and whether it’s the right career path for you. Accutran Global is “always” interested in hearing from new transcribers. At this time, they are not hiring until March 1, 2019. However, Accutran is seeking experienced voice writers/stenographers located in the U.S. and Canada. Keep in mind, they have peak times when there is a ton of work and non-peak times of the year when there may be no work at all. Pay rate is by the word ($0.005 to start). Payments are made on the 15th of each month. You will need to pass a transcription test to be considered. Accutran Global is not ideal for parents or caregivers who are responsible for others; you are expected to finish claimed work ASAP. In other words, you cannot have any distractions that delay your turnaround times. Appenscribe offers global transcription jobs online. So if you are fluent in multiple languages, you will have more work available to you. To get started, you will need to register an account and pass two small transcription tests. Contractors report different pay rates, but you can expect a rate of about $0.005 per word. Payments are made twice a month. Work is not always available through Appenscribe, but when work is available, you can claim it any time day or night! There are non-transcription projects available at times too, if you want to expand your work-from-home earnings. Bam! mostly offers entertainment transcription services, but they also do legal, corporate, finance, research and general transcription projects, too. If you can pass a skills test, they will consider you as a contractor. Their application is not found on their site. You will have to contact them via their contact form or email them at bam@bamtranscription.com to express your interest as a potential typist. Birch Creek Communications often hires legal and corporate transcriptionists. As far as transcription jobs online for beginners, this one is pretty good since it will give you practice in areas of transcription that typically require a couple years of experience! Pay rates vary based on type and length of file. If interested, you will need to submit an email inquiry and go through a screening process to start working. Don’t forget, you can jump right into the world of legal transcription by taking the free legal transcription course at Transcribe Anywhere. CastingWords has two ways for transcriptionists to find work: The CastingWords Workshop and Mechanical Turk. Through their Workshop, they offer has transcription jobs online in 66 countries. Through Mechanical Turk (MT) you’ll never know what you will find–sometimes there are a ton of HITS (MT lingo for jobs) and other times, there is hardly anything. The pay rates vary from job to job, but all you need is $1.00 in your account to request payout. Like CastingWords, Crowdsurf posts their transcription jobs online through Mechanical Turk. They offer short transcription and captioning tasks. To get started you need an MT account. You will accept and work on Crowdsurf jobs through the MT platform and receive payments this way, too. If you’ve never heard of MT, it’s an Amazon company. There are hundreds of thousands transcription and non-transcription jobs posted here at any given time. Daily Transcription provides corporate, legal, and entertainment transcription with same day turnaround times (hence the name!). There are no guaranteed hours or amount of work available, but they are always looking for transcriptionists at all experience levels as long as they are reliable. Work is available on an as-needed basis. To get started, you just need to submit a short form and then head over to their testing page. Get Transcribed offers transcription jobs online and reviewer positions, too. Of course, you have to work your way up to the reviewer/QA positions, but if you do, you can earn $0.12 per minute you review on top of the $0.23 per minute you transcribe. Payments are made once a month via PayPal, but you need to have earned at least $100.00 otherwise your earnings rollover to the next month. GMR Transcription has general transcription positions available consistently. One of their projects (medical condition interviews) has enough work available that you must be willing to transcribe and proof 60 minutes of audio per day to be considered. Remember, an audio minute and a real minute are two different things. These opportunities are open to typists with no experience as long as you can pass the test. This is another great opportunity for beginners seeking transcription jobs online. Neal R. Gross has legal transcription opportunities available (which usually requires a couple years of experience!). What you will need is the ability to return files the next day, type at least 60 WPM, and be able to work at least 30 hours per week (if you type the bare minimum of 60 WPM, this would equal about 5 hours of audio per week). You will need to submit a resume and cover letter through the contact form on their web page to get started. RNK offers legal and entertainment transcription jobs online. You must submit an email with your resume attached to be considered. Candidates who can type quickly, accurately and have the ability to play video and audio at the same time will be considered regardless of previous typing experience. There is a skills test that you will be required to pass before you can work on client files. Scribie is where many aspiring typists go when they first look for transcription jobs online. There is a waiting list of thousands (yes, thousands!). They hire worldwide and pay via PayPal. The pay rate is $10.00/audio hour. If you complete three hours of audio in a month, you get a bonus $10.00. There are pros and cons to Scribie. The cons are the low pay. Even as far as transcription jobs online for beginners goes, they pay pretty low. But on a positive note, there are no cash out limits and no commitments (work as much or as little as you want, when you want!). Tigerfish offers flexible transcription jobs online. They have a ton of different project types available (focus groups, interviews, law enforcement, documentaries). You will have to complete three five-minute tests in order to be considered for paid projects. These five-minute tests should take you about 20 minutes each to complete (if you are going way over the 20-minute mark per test, transcribing may not be worthwhile for you). Miami-based Transcriptions ‘N’ Translations does transcription projects for big names like Discovery Channel and Animal Planet. If you can pass a skills test, you can contract with them. To get started, you need to submit your resume along with a short form located on their website. TranscribeMe! posts transcription jobs online for English and Spanish typists. The first step is filling out a form. After that, you will be directed to take a test. If you pass, someone from their Operations Department will contact you within 48 hours to discuss the next steps (don’t worry, if you fail, you can retake the exam in 24 hours). Transcribers get paid per audio hour. Payments are made every week. From medical transcription to verbatim transcription and even summary writers, Ubiqus offers a ton of different transcription jobs online for beginners. If you can provide same day and next day transcripts, you are likely to receive more work. You will need to successfully pass their application process to get started. All typists start out at the same rate regardless of experience. Payments are made every two weeks. At this time, they are only recruiting native English-speaking, U.S. residents. Formerly, Verbal Fusion, 1-888-TYPE-IT-UP pays the best starting rate for transcription jobs online for beginners. You must be a U.S. resident and fill out a short questionnaire to be considered. When they are hiring, you will be contacted and asked to take a short transcription test. If you pass, you can be hired on as a contractor. Keep in mind, it might be weeks or months before you are invited to test. So even if you think you might be remotely interested in this opportunity, it is best to get your application in ASAP! Note: As of February 10, 2019 they are hiring. However, there is a $35 entrance exam fee to be considered. This fee is to make the number of applicants more manageable. Now, they’re able to respond to successful exam takers within weeks instead of months. Verbal Ink is always interested in hearing from transcriptionists who want to join their team! You will have to pass a test to get started (their test is notoriously hard!). If you can pass, they are a great company to get in with. To get started, you will need to submit your resume and cover letter for consideration. 3Play Media provide transcription jobs online as well as editor positions. You must pass a series of skill and proficiency tests to be considered. In order to be successful, you should be able to type at least 75 WPM and be proficient with internet research. It is a bonus if you are skilled in Excel. Pay varies per project, but contractors can earn anywhere from $10.00 to $30.00 depending on individual speed and efficiency. At Transcription Outsourcing, you can find a number of online typing jobs available. There are listings for legal, general, financial, and medical transcription jobs. To get started, you just need to fill out a short application. Their office will contact you directly should they have any questions or need more information. So, there you have it — 19+ companies that offer transcription jobs online for beginners. Remember, sign up for one (or both) of the free mini courses at TranscribeAnywhere. Do you know of an opportunity I missed? Have you worked for one of the companies listed? If so, please leave your comments below–I’d love to read them! Don’t forget to visit my job leads page to find even more work from home jobs! This was very helpful information! I’m interested in trying some of these out as supplemental income. Do you need to have certain software on your computer? Or Would I be able to complete this type of work with my iPad that connects to a keyboard and a good headset? Transcription work is great for supplemental income! Typically, you need some kind of software to playback the audio files. In most cases, the industry standard is Express Scribe. There is a free and paid version available for download. Sometimes, a company will require you to use their own software. For example, if you are a Captioner for REV, you have to use their platform known as Quill in order to caption for them. Having recently completed an online MTE program, and after 25 years as a legal assistant/paraglegal, this info is more than helpful! Thank you for your time. You’re welcome, Vickie. I too have a legal background and never had any problems finding transcription work. Now that you have completed an MTE you’ll have plenty of opportunities to choose from! Best of luck to you! This was very helpful. I’m trying to get started on transcription to be able to work from. Where can you get a foot pedal? My husband’s trying to find freelance writing jobs and has been thinking about starting a blog. Thank you. Best of luck with your transcription career! I have recently applied to GMR and taken test!! Good luck! Transcription is a great way to to work from home (with a lot of work available!) If you need anything, please let me know! Hi, This is a very helpful article. I just want to ask if you know if any of these transcription jobs pay via wire transfer? I’m currently with Scribie and unable to access my funds because Paypal doesn’t really work that way here in Qatar. I hope you can help. Thank you! My current work schedule is getting ready to change. I’m looking to fill 2-3 days a week of work to compensate my schedule changing. I would prefer working from home, I’m just a little hesitant about pay with transcribing. Is it something that the pay could increase with time? Also, when I pitch this idea to my significant other what useful information can I bring to him, because I’ll know he will be more hesitant than myself. But I really want to work from home. Any helpful information is appreciated. If you work as a freelance general transcriptionist, you can definitely increase your rates as you gain experience. What you should know is there is A LOT of transcription work out there — it’s just a matter of setting yourself up for success and finding the right clients for you. 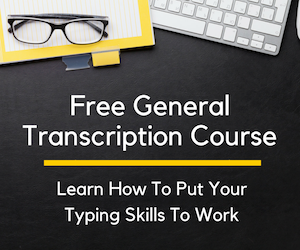 There’s a great free course over at Transcribe Anywhere that I can’t recommend enough. It will give you a good overview of what it’s like to be a general transcriptionist and will help you decide whether it’s a good fit for you. If you’re on the fence about transcribing for a living (even part time), it’s a good place to start. When transcribing, you’ll have a few startup costs, too. For example, you’ll need to get a decent headset. You may also want to consider buying a foot pedal to increase your speed and productivity. The industry standard transcription software can be downloaded for free. It’s called Express Scribe. The freebie version will do everything you need it to do as a beginner. However, the free version is only compatible with one specific foot pedal called AltoEdge — so keep this in mind. For about $100 you can get a transcription bundle on Amazon which will include a good headset, foot pedal and the pro version of Express Scribe. Hi Ashley. I just want you to know that you are doing a very good job. The information u provide is really helpful. God bless u. Im a begginer freelance transcriptionist. My laptop just developed a little problem. I’ll start working, really hard, as soon as i got my laptop back. Will email u if i need assistance. Im grateful in advance. Thanks for the useful information. Is it possible to work as an independent contractor when you live outside the US? I’m really interested in working from home. I do have a paypal account. I live South Africa and don’t know where to start looking for jobs online working from home. I have done typing for a lawyer/accountant for nine years and would like to work from home as I really need the extra money to fill the holes in my budget. Would it be possible to help me or maybe guide me in the right direction. In fact, transcribing audio needs someone who can stay focused with strict attention to detail. Also what’s even more interesting about transcription is that you can make more money depending on how fast you can type how many languages you speak..
Hi! I’m a stay at home mom and we could really use some more I come right now so I’ve been lookin into online jobs and this sounds great! Thanks for the info! Do you know which of these might pay the best? Thanks again! Great information, thank you. A couple questions…could you tell me what the average bring home is? A guesstimate..$100, 400 or more? Also what is a foot pedal? Thanks for stopping by! As a beginner, it’s really hard to say what your pay would be each week. Really, it depends on how fast you are and how much work is available. In transcription, the real money comes when you source your own clients. And, believe me when I say, there are a lot of them out there — podcasters, bloggers, marketers, lawyers, authors, and teachers (to name a few) all use transcriptionists for different projects. 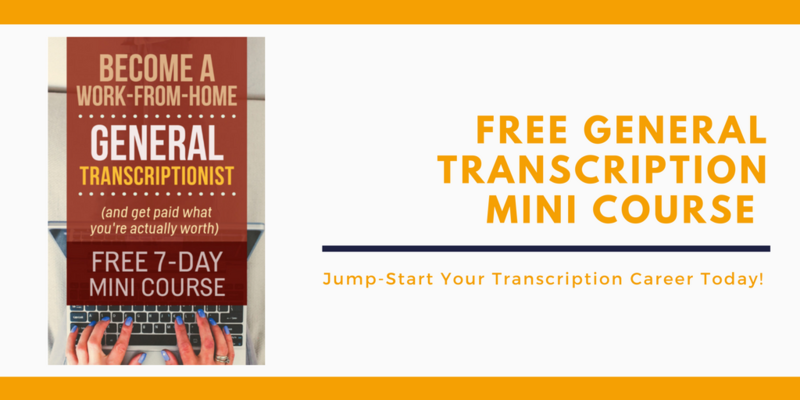 You should head on over to TranscribeAnywhere to take their freebie mini course. It will give you a good understanding of what it’s like to earn an income as a typist. As far as a foot pedal, it’s an actual pedal you plug into your computer that you use to control audio playback. It helps increase your speed and accuracy 🙂 A decent foot pedal will set you back between $50-$75. But again, consider heading on over to TranscribeAnywhere to see whether or not you could actually see yourself working as a typist. Though I’m American, I live in India and the Internet connection isn’t always the fastest. Do you think that will be okay with some of these companies? Thank you in advance, Ashlee! Thanks for stopping by. Yes, some companies do hire internationally, so you’ll be okay there. As far as the internet connection, I don’t think that will be a problem as long as you’re able to listen to audio and upload work — you should be fine! I want to start from begining can u help me out it n guide properly so that I can get job ..hope u reply as soon. Okay thanks, Ashlee, I appreciate it! So the only other thing that’s slowing me down from applying for some of these companies that hire beginners is that a lot of the reviews for nearly all of them say that you will only earn a couple dollars per hour or less, and even in India, that won’t go very far, lol. I know it depends on your speed but even people that seem to be fast typists, as I recall from these reviews I looked at, still say you can’t make more than a few dollars for an hour’s worth of work. Though, I know if I can hang in there that with some experience, in the future, I can apply for positions for more experienced transcriptionists and can then begin to make more money. Thanks again in advance, Ashlee, for any input you may have in this arena! You’re welcome. I think those reviews are pretty accurate — you’re certainly not going to get rich typing for any of these companies. Most people probably use these opportunities as ways to earn extra money and not main sources of income. I hope that helps! Let me know if you have any questions! As long as I can hang in there money-wise, it is a good way to get experience! Thanks, Ashlee, for the quick response, and I’ll check Rev out! You’re welcome, Melanie! Best of luck to you! I worked as a medical transcriptionist for several years and I am very interested to work as a home based transcriptionist. I just want to ask if you have a list of companies that accept international on-line workers? Thanks for your reply. Thanks to your earnest write up and replies on this blog, I just enrolled in Transcribe Anywhere class using your link. Thanks for stopping by! You’ll love the course at Transcribe Anywhere — it really is an effective way to build your own general transcription business 🙂 Let me know if you have any questions! why it is hard to find Arabic transcription work?! I read that we need to maintain, at all times, adequate insurance coverage (including general liability coverage and Workers’ compensation coverage) as required by applicable law, in the Terms of Agreement section of the application process. If this is so, do you know where we can get the best rates? I would also like to know the insurance requirement laws. Thanks for stopping by! I’ve only come across one transcription company that requires their contractors to carry insurance. This insurance is a type of personal liability policy commonly called “errors & omissions.” As the name suggests, it helps protects you in the event you got sued or caused damages because you made a mistake or left out something as a transcriptionist. Many professionals choose to carry this type of personal liability insurance including CPAs, bloggers, financial advisors, writers, etc. Typically, transcription companies will have this insurance to protect their contractors. So, I don’t want you to think it’s something you have to carry in order to work from home as a transcriptionist. However, if it gives you added peace of mind, it is worth it and often very affordable. Most errors & omissions policies can be had for $15-$25/month. I was trying to get on SpeakWrite as a general transcriber but their software doesn’t work on Mac, so had to eventually skip out though I reached the test jobs phase. Before signing security forms, I did my research and read a lot of negative reviews from former in-house employees about the ethics of their business practices and just general running of the business and treatment of employees. Even though I would have been an independent contractor, what I read didn’t sit too well with my personal values. I was really turned off, so decided not to continue on that basis as well. I was wondering if you knew of the same kind of news from any of the companies you listed. Can you apply for more than one company? That way you can overlap jobs? So when one is not offering much of anything you may have a different company offering some. I am looking at get started in transcripiton on a part-time basis. How do I get started? I see some on-line courses offered but don’t know which ones are better than others or if that is the best way to start. I am looking for about 15 hours a week of work as I already work full-time. I know I need a headset and footpedal. Suggestions/thoughts on how/where to begin? Thanks! Am a Kenyan citizen. I love writing. writing is my true passion. i really need help though to work this out. its my first time and i really want to do this. can someone help me out please? I wanted to say, thank you for the very helpful information. I am a beginner and was looking for another job; possibly at home. I have medical background and live in the US. Thank you so much for starting this websie. I have been researching and looking online for typing at home jobs and this is the most information that I have gotten without having to pay for the program or information. It has been really helpful and greatly appreciated. I was wondering if someone could help me. I want to pursue transcription I’m curious as to which area is in a high demand. Ideally I would want to work from home. Is legal or medical transcription in higher demand? Also can anyone recommend or refer me to where they received their training? I have been reading where many say they wasted money on schooling or online courses. Any input would be much appreciated. Thank you!! This was a very informative and educational site to explore. It has been my desire for many years to transcribe full-time, but I never had the time while I was gainfully employed as a legal secretary and paralegal. Now that I am retired I am finding out that I am bored to tears. Transcribing full time has been a life long dream and now I can finally make it happen. I have over 45 years of transcribing experience in a law firm setting. Before I leave this site , I want to say Thank you to Ashlee Anderson for putting this out here for beginners like I am. Next I want to Thank all the Great responses to her post. I have learned so much from her and others with more info to match her info. Very informative for the beginner in realizing their dreams to earn some part-time income. How does one go to become an expert when they are just starting out and can a person from an asian country earn something from those many online jobs.Well done, keep up the good work, you’ll be remembered..
Hey Ashlee! One Anderson to another, can you tell me what your thoughts/ experience with Rev are? I see you mentioned them in your comments but didn’t list them. Surely a top 20 list is cleaner (ie more soothing to my neuroses) so was there any reason you’d exclude them? This is such an extensive list and very detained. Thank you for sharing. Update: I noticed that Bam website is not working. The link seems to be broken. If you can take a look at it, that would be great. Thanks again. Can I apply on those said companies even if I’m outside the country. I’m from the Philippines. Thank you. I do transcription job. Looking for work, content writing, Audio / Voice to text etc. Are these companies you listed only for American job seekers? I am Canadian and looking for transcription jobs, too. Often I use go-transcribe.com to help with the transcription process. They create a quick draft and I just need to make adjustments! Really helps cut down my typing time! With the Appenonline website it’s not what it cuts out to be. I have an account on there and the website only works half the time. When I first got my account they even send me a message saying that either the work doesn’t load or the instructions on test don’t load which is very true. It’s not worth the time. You mention some of the sites have a payout minimum. Do you get W2s from these companies? Thank you so much for the helpful info!! I currently work 50-60 hours at a hospital as a pharmacy technician and I want to be home more with my family. I would love to go part time there and then supplement as much as I want or need doing this. I deal with taking voicemails and verbal orders from nurses and doctors and have to “decode” prescriptions all day. If you know how doctors write you know it’s not always easy. I type all day long and submit insurance claims. Since I have been doing this for 10 years, I don’t have any other experience or education background. Do you think this would be something I could get into and do well? Just not sure given my background what places would probably work better for me? If you have any suggestions or know of a place I would be very appreciative 😊 Thanks in advance and look forward to your response. Great list, but your Bam link is faulty. The hyperlinked list item navigates to bamtranscription.com/about, but that link brings me to a 404 Error. The actual company’s About Us page is at bamtranscription.com/about_us.html and their homepage is just bamtranscription.com. Thanks for the list, though! I worked for a different company called Focus Forward a couple years ago but had to take a hiatus due to a hand-crush injury. Now I’m repaired and ready to get back at it, so this list will be very helpful in reacquiring typing work from home. Hi, read a lot good info about the Tigerfish and about their friendly service. Thank for posting these useful jobs transcriptions. It’s very curious to read and imagine the company like a person, with which you will or only think to work. http://www.transcriptionjobs.info/best-49-medical-transcription-jobs/ ) Mostly, there are medical and you might notice a couple of jobs, that you have already mentioned here. It’s might very interesting for those, who looking for transcription job in the medical sphere. If you want you can add them to your list. Thank you for posting these transcription jobs. I am a recently retired elementary school teacher. (36 years) I also teach at our local university, part time. I am very interested in becoming a transcriptionist. I have no experience in transcribing, however, I am a very quick and accurate typist. I’ve always enjoyed typing and I’ve been looking for something like this to keep me on my toes and help make a little extra money. Now I know where to begin looking. I used to work in TranscribeMe but I didn’t continue because of the conflict in time with my other site. But I guess they are still operating until this time. Perhaps I could also check the other sites for information and probably to be shared with others. Thanks for stopping by! I didn’t know 1-888-Type-It-Up was now asking for a $10 application fee — that wasn’t always the case. My opinion? No! It’s not worth it to pay the $10. Think of it in the real world, how often has an employer asked you to pay money to apply for an job opening? This article was very helpful. I have over 20 years of experience as Administrative Assistant. My native language is Spanish but I’m fluent in English. I’m not a certified transcriptionist but started working some hours with Quicktate a few months ago. Do any of these companies have Spanish jobs to apply for? My company needs experienced general transcriptionists. We have really interesting work and lots of it. Can I post a job listing here? Hello! Email me at ashlee(at)workfromhomehappiness(dot)com about the job, and I’ll be happy to get it posted to my job leads! Thank you for putting together this resource. A person who left a comment on this page, a guy by the name of Bruce, suggested Scribie as a starting point for my transcription job seeking so I am signing up for this company first. I like the fact that you get paid a day after I transcribe however many audio files that I choose to transcribe. I always wanted to get out of the rat race and this the beginning of this journey. Just wanted to let everyone know the application fee for 1-888-TYPE-IT-UP has gone up to $15 as of the posting of this comment. I’ve worked for eScribers last year doing transcription, they paid weekly and I never had a problem with them. I applied for GMT. My question is, how long do I have to wait to take the test? Thank you for so much information. I’m trying to decide how to best work from home transcribing. I went to Court Reporting private college several years ago, so I am quite familiar with the equipment and know that it is best to purchase that. I can type upwards of 75 wpm and accurately. My question is, do you contract with one company or can you contract with more than one. I don’t want to start with one company and then rarely get jobs. From what I have been reading, this happens because of work flow or seasonal reasons. Excellent post. Thanks for putting together this awesome list of transcription door steps. I’m sure this will be a great help to the beginners to identify their own platforms. Thank you. hey i find your article awesome,am from Kenya,and i have full time network,have worked as a typist in a law firm and my typing skills is quite fast.Now being in Kenya,can i find a Co that hires Internationally?I would like to do transcribing as a part time hustle. Hi, I checked out 1-888-Type-It-Up and they now require a $25 non-refundable application fee every-time you apply! That doesn’t seem worth it to me? Thanks for letting me know! I agree. It is NOT worth it to pay the $25 application fee, seeing as there is no guarantee you’ll ever hear back from the company. Thank you for all you did to help us! 3Play Media is for U.S. residents only, too. Do these companies only hire Americans, or is it possible to get hired if you’re not from the United States? I’ve never done any transcription is the some classes or something I need to do before I try. Hi Ashlee, I’m so glad i come across this helpful article,but my question is that can I apply for a transcription job as a Nigerian? i will be waiting for your response, thanks in anticipation. Hi there! I’m looking into this as a secondary income source. I have a regular job, but right now I’m the only one able to work for my family so any extra money I can make is helpful. Do you know which of these sites are the most flexible with how much you work and when you work? For me, it would be ideal if I could do it for a few hours at night every night, like start at 10pm and go until midnight or 1am. I’m so glad i come across this helpful article,but my question is that can I apply for a transcription job as a Nigerian? i will be waiting for your response, thanks in anticipation. Wonderful post! I just wanted to let you know that I just applied with GMR Transcription and they notified me that their recruitment is on hold indefinitely and that I would be notified about my submitted test transcription once their recruitment continues (if that ever happens). If anyone else has been recently recruited, please share as that would be great to know! Thanks! Hi. I was looking at applying for GMR. Before they do accept international workers, but now they have on their website that they only accept US applications if you pass them a resume. Do you have any idea on this? Thanks! Hi. I was looking at applying for GMR. Before they do accept international workers, but now they have on their website that they only accept US applications if you pass them a resume. Do you have any idea on this? Thanks. I am from India. Can I apply too? i really want to quit this mundane job i have get into this work at home but the patience is needed. thanks for the information. Hi am navin from India, i have 10+ years exp in Medical Transcription, can i have MT work from outside of the india. plz help me in this regard. hi i m from india. can i apply for this job? Thank you for all the wonderful leads on becoming a transcriptionist. I applied and tested for a specifically Daily Transcription. I passed the test with flying colors and then it wanted me to create a survey via Survey Monkey! Not sure what this has to do with transcribing but I will not be continuing. Very disappointed. You may want to update Daily Transcriptions requirements. First of all thank you for the info and advice. Although I am always a little skeptical of these as you are most likely making money typing this article for us, yet you do seem legit versed other sites I’ve seen. I did take a medical transcription course and due to carpal tunnel both hands couldn’t continue, had surgery. At point where I need to make extra income so I am going to give it a try. Thank you again, hope something comes of this. Have you considered Take Note? Thanks for the updated info! I wasn’t aware of Daily Transcription changing their requirements. I’ll have to give them a second look. Thanks for the lead, Amy! Why does Appenscribe require you to tell them about any social media accounts? Why do they need to know if I have Facebook or how many friends I have. That’s ridiculous. Do all the transcription companies listed here require this? Great question! Appen has a lot of different projects you can work on, besides transcription. Many of these projects involve social media tasks. To figure out if you’re a good fit for the projects, they like to know if you’re familiar with Facebook. To gauge your savviness, they ask questions about your social media activity, including the number of friends you have. Hope this helps! Wow, reading this has really been a blessing. I did some transcription when I was taking classes in college i took a course. The course I took you did use a foot pedal. I also did a little transcription for the welfare department. I was sort of slow at it but I did enjoy it. I am looking to get back into transcription again and to supplement my income. Some transcription jobs specifically require voice-to-text others but not typically. For the most part, you will be listening to pre-recorded audio and typing what is being said using word processing software. Hi Ashley! I came across your article because I want to start working with transcription. I live and work in Argentina. Which ones would you recommend for me? I know many won’t accept me because I’m not American nor Canadian. Another question: Can I do it in more than one language? I absolutely NEVER comment on websites but I feel obligated to leave a message of praise for you right now. Your Website is amaaaazing! I truly appreciate how much information is provided to your readers, free of charge! For those of us who are struggling and trying to make a difference in our lives, I can’t tell you how much this has helped me right now. I have emailed myself multiple links and will be applying for a few job sites tomorrow. 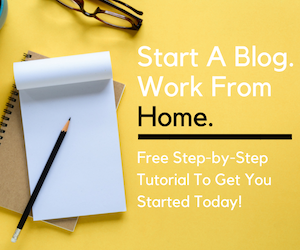 Once my situation improves, it will be an absolute pleasure to take your blogging course and go through you for the hosting and such. Please accept my utmost gratitude for your efforts today! I truly appreciate it and you definitely have a new lifelong subscriber. how do i get enrolled in online typing jobs? Thanks Amber! Such a great compliment. I’m glad you took a minute of your time to say hello. As always, if you have any questions feel free to email me directly!